At 21, Abby Jeans has already had a lot of experience with dance. I sat down with Abby to talk about her life in dance and where she hopes to take her skills in the future. Abby started dancing with Catherine when she was 12 years old. At that time Catherine was 19 and the dance classes were given in Catherine’s house. Abby took classes at the house for 4 years before the studio was moved to downtown Parkville and Abby was a senior in high school. That was the year she gave up her soccer cleats for good and traded them for dance shoes. As a senior, Abby was on the Platte County High School dance team. Abby now attends Park University and started on the cheer team. But her real passion was dance and Park did not have a dance team. She approached Park University’s head of student leadership with her idea to start a dance team. And because of Abby, the Crimson Dancers dance team became a reality. Abby reports that the school has been very supportive. The Crimson Dancers are at most Park University sporting events and many events in the community. The dance team had been using old cheer team uniforms, but the dance team has since doubled in members and are looking to acquire new uniforms. Abby is in charge of the tryouts and is instrumental in choosing dance team members for the coming year. As the captain of the team, her responsibilities include creating and teaching dance routines, including many styles such as jazz and hip hop. The K Crew are ambassadors/cheer team for the KC Royals baseball team. During the baseball games, the K Crew entertains the crowd around the stadium The K Crew meets and greets fans and cheers with them throughout the game. 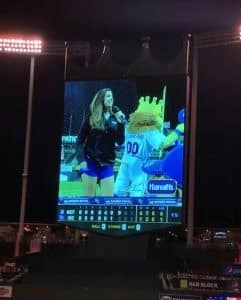 At the 7th inning stretch, Abby has had taken hold of the microphone to sing “Take me out to the ball game” for Royals fans and adoring family members a number of times during the 2017 season. Abby believes dancing was instrumental in building the confidence she needed to perform in front of 35,000 people. Her position with the K Crew requires her to try out every year. After two years with the Crew, Abby has decided to hang up her uniform. She believes her time with the Crew was a valuable experience, but life is calling her to try something new. She loves the Royals and hopes to stay with the organization in another capacity which challenges her in other ways. Abby is a dance instructor at Catherine’s. 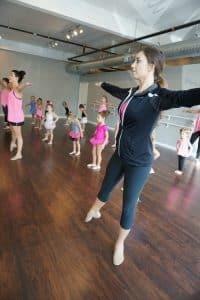 She teaches the youngest in Catherine’s dance classes focusing on the 2-3-year-old to 2nd grade dancers. She also teaches private lessons to dancers of all ages. She works with dancers to improve their technique for the upcoming competition season. Abby plans on graduating from Park in December 2018 with a degree in broadcasting. Her dream job is to be a reporter for The Today Show. She likes the idea of reporting and exploring upbeat news items with a national exposure would be exciting. She knows that a local news station is more than likely going to be a stepping stone to that dream. She also promised Judy she would teach one class for as long as possible. Since her involvement with Catherine's Dance Studio, Abby has proven to be a girl who accomplishes whatever she sets her mind to. Catherine’s Dance Studio is blessed to be a part of her past and hopefully her future as well.